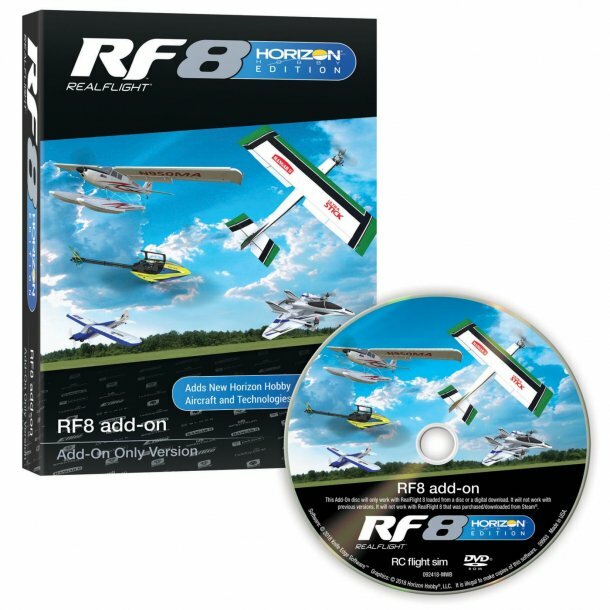 Realflight RF-8 Horizon Hobby udgave, Add-On simulator software. Tillægs-CD til Realflight RF-8 simulatoren med masser af modeller og teknologier fra Horizon Hobby. If you purchased RealFlight 8 after September 1st, 2018 you are eligible to receive this Horizon Hobby Edition Add-On (RFL1002) at no charge! Please contact us at websales@horizonhobby.com to begin the process. You will be asked to provide your RF8 serial number and a dated proof of purchase. Please allow 3-5 business days for response, and 7-14 business days to receive the add-on after the request is processed and approved.